With the warm and lazy days of summer in our rear view mirror it’s time to get out our favourite sweater and start planning a “Fall Bucket List”! And why not? There’s some pretty cool things to do in Fredericton, and with the fresh, crisp fall air, it’s the perfect time of year to get the most out of being outside. In Fredericton, the “unofficial” beginning of Fall is the Harvest Jazz and Blues Festival! From September 11-16 enjoy the best international festival experience on Canada’s East Coast, with the sounds of jazz, blues and world music taking centre stage. For full line up and ticketing info, click here! I spent years with work on this festival! Glad to see it still keeps getting better. Lord Beaverbrook would be proud! It was the city’s most anticipated expansion last year, the Beaverbrook Art Gallery! If you haven't been yet, you NEED to check out the beautiful new pavillion, with an impressive new addition of sweeping windows, 14,000 square feet of interior space as well as a café, artist in residence area and new exhibition and programming spaces! Beer and Bikes? Yes, it’s a thing! Fredericton is certainly drawing its line in the sand when it comes to the craft beverage industry – it’s a booming business and what better way to showcase the many taprooms in Fredericton than to pair it with our amazing bike trails! Some tasting rooms are off the trail network, so in that case we suggest hitching a ride on a city bus (they are equipped with special racks for your bikes). With cooler weather, it is the perfect pairing that gives you a “taste” of our craft beer/cider industry as well as Fredericton’s trail system. One of the nicest and most colourful driving routes to see fall colours in New Brunswick is on Highway 105 North to Keswick Ridge (Burtts Corner turnoff on Route 104). The dazzling array of reds, oranges and yellows quite literally takes your breath away. But don’t limit yourself to this driving route; there are so many areas to choose from. Follow New Brunswick’s fall foliage map to find out the best spots and the best time. If you haven’t been to TreeGo Mactaquac yet, what are you waiting for? This aerial adventure within the beauty of Mactaquac Provincial Park awaits you, complete with swinging ropes, zip lines, and the occasional “OH MY GOODNESS!” It is a fun, adrenaline-inducing way to spend the morning or afternoon. The best time to do the course at TreeGo is the fall. The temperature is perfect and what better way to view the world…from up high! TreeGo’s season ends on the Thanksgiving Long Weekend. Register in advance by calling 1-877-707-4646 to hold your spot, or visit their website. Immerse yourself in another era – once you find yourself at Kings Landing you will literally feel like you stepped back in time. Tour this 19th century village and pitch in – learn to make butter, cook on an open hearth, be a part of the classroom (make sure you aren’t picked to wear the dunce cap!) You can easily spend a day being a spectator or participant, your choice! 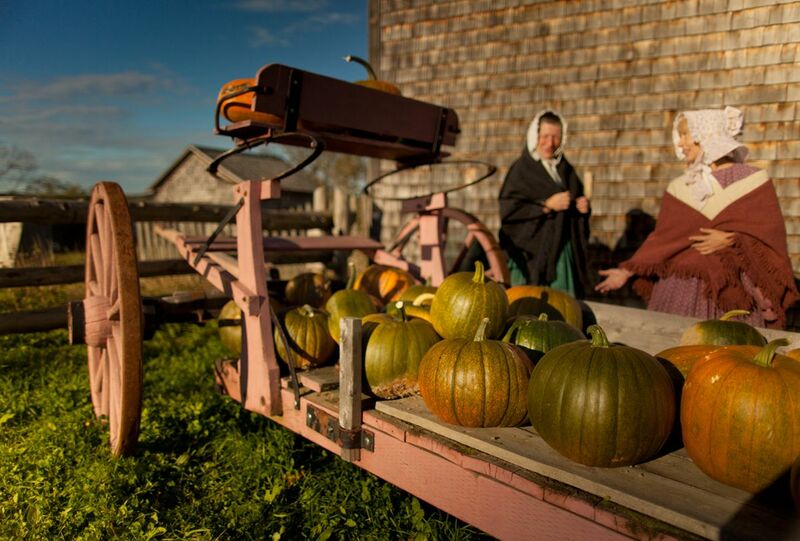 Kings Landing is open 10am-5pm and wraps up their season with special Thanksgiving festivities on October 8. Fredericton is a runners dream. But what makes a run “good” and what makes a run “great” depends largely on time of year. Fall is the ultimate time of year to run. There is low humidity, the temperatures are just right, you’ll be pleasantly distracted by the fall colours and in most places, you’ll be running right alongside the lovely Saint John River. There are an infinite number of trails in Fredericton (115 km to be exact); a good portion of the trail is paved, but if you are into trail running, head to Killarney Lake or Odell Park. Be sure to pick up a copy of the Fredericton Trail Map! Apple picking is most definitely synonymous with Fall! The Fredericton region has a good selection of apple u-picks. Make an outing of it, bring your camera and some sturdy bags and get ready to pick the best ones in the orchard. For a complete list of apple u-picks in the Fredericton area visit our blog! Markets are great places to visit but don’t forget to bring your appetite! Why? Because you don’t want to miss any of the goodies on offer – from samosas to gyros to baked goodies; and the best part? Fresh, seasonal produce grown locally! From one of Canada’s top farmers markets, the Fredericton Boyce Farmers Market, to the Fredericton Northside Market, to Moxon’s Country Pumpkin, the Cultural Market and more – you can find a full market listing on our website or read our market blog post. In the mood for a treasure hunt? Geocaching is the modern day version of this! All you need is a map, a GPS and a sense of adventure! Want to find the road less traveled? Check out the Fredericton Geocaching Tour which identifies 24 hidden gems divided into 3 categories: cultural, historical, and vistas. It’s a great way to explore Fredericton! November in Fredericton brings with it some pretty cool events. The Silver Wave Film Festival brings over 100 films by local, national and international filmmakers across multiple venues in the city. Then, take part in Canada’s oldest spirits festival, the New Brunswick Spirits Festival, will take place from November 13-17. Over 275 of the world’s finest spirits along with guest speakers, dinners, tastings and more during this popular annual event. If you have a spirit for adventure and a love of the outdoors, spending time in Fredericton during this colourful time of year should definitely be on your to do list!